The two-room health center in Jhansi District has two beds, a chair, and a table. In one of the rooms, an auxiliary nurse midwife types a newly pregnant woman’s weight and blood pressure into mSakhi, an application on her mobile tablet. Glancing over her shoulder she tells me it’s been a challenge convincing women to give birth at facilities like this. Many prefer to deliver at home. Still, 60-70 women now deliver here each month—up from around 15 just a few years ago—as a result of a government incentive scheme that encourages institutional deliveries. In India, especially in rural, underserved areas like where I’m volunteering, many women’s and babies’ lives are lost due to complications during pregnancy and childbirth. More than 775,000 newborns die each year in the country, and an estimated 50,000 women die from pregnancy-related causes. Auxiliary nurse midwives—community-based midwives—along with accredited social health activists, or ASHAs, have the potential to help prevent many of these deaths. ASHAs are community health workers who provide pregnancy counseling and health education to women, accompany women to skilled delivery care, encourage healthy behaviors, recognize mother and baby danger signs, and promote immunizations and proper newborn care. But all that’s been a pretty tall order for the ASHAs. Their paper-based job aids and heavy counseling books used during home visits were cumbersome and difficult to carry. And paper checklists to assess mothers and newborns were complex to follow. But now mSakhi, a self-guided audio/visual tool that works on tablets or simple mobile phones, is helping these frontline health workers more effectively communicate with pregnant women and new mothers. mSakhi is based on the National Rural Health Mission’s curriculum for ASHAs and includes over 150 text messages, audio recordings, and illustrations on prenatal, delivery, and postnatal care; breastfeeding; immunization; and nutrition—and all in the local language. Here’s how it works. First, an ASHA registers a pregnant woman in mSakhi and enters baseline information on her overall health. Then the ASHA tracks her progress during prenatal home visits. Information is automatically transmitted to her supervisor, an auxiliary nurse midwife, for review. The auxiliary nurse midwife sees the pregnant woman at key stages of her pregnancy and if any concerns arise. When the woman delivers, the ASHA or auxiliary nurse midwife records the birth in mSakhi, which generates a post-natal home visit. Today several ASHAs are operating a vaccination clinic outside the health center. I meet Meena and Usha, who are giving polio drops to children in the village. They invite me to come along on some home visits—starting with a woman who recently gave birth to a baby boy. As we walk, Meena tells me that carrying the heavy picture books and completing difficult check lists made ASHAs’ visits really tough. At times they forgot some of the key questions they were supposed to ask. But mSakhi makes their work easier. Usha adds the application prompts step-by-step questions to ask the women according to their stage of pregnancy or their baby’s age, and now nothing is missed. When we arrive, three young girls are playing outside and are so excited to see a new person. I ask their names but they hide their faces, too shy to answer. The home is simple, tidy. I greet the older woman sitting on a wooden bed. In the next room 25-year-old Mamta sits holding her new son, who sleeps peacefully. Meena introduces me then begins her basic inquiries. How are you feeling? How is the baby doing? Then she starts using mSakhi and goes through a set of questions for a new mother. Are you breastfeeding? How many times a day? She completes the check up and lets the mother know when she should attend a vaccination clinic, suggests healthy food to eat, and explains how to care for the baby. We exchange good byes and head for another woman’s home. She is six-months pregnant. Usha asks how she’s feeling. The soon-to-be mom says that thanks to the iron supplements she receives from Usha, she feels more energetic and can feel her baby kicking. She confirms she’ll be going to the health center for her delivery. From there, we walk to the Central Health Center where I meet with a group of ASHAs who are learning how to use recent enhancements to mSakhi. They, too, share their positive experiences using the tool. Then they giggle and insist on clicking a photo with me. I’ll never forget my time with the ASHAs and how their use of mSakhi is helping them provide better quality care to mothers and their newborns. You can learn more about mSakhi here. Reema Sharma was a Vodafone World of Difference Volunteer with IntraHealth International in Delhi. World of Difference (WOD) is Vodafone’s unique corporate giving initiative, which mobilizes its employees to work for a charity or nonprofit of their choice for a dedicated two month period. mSakhi was developed by IntraHealth initially through funding from Bill and Melinda Gates Foundation. 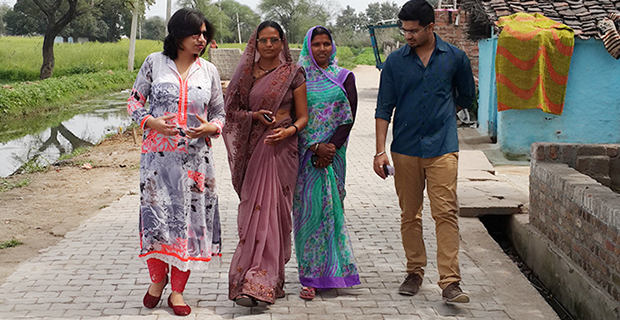 Reema Sharma (second from left) poses with accredited social health activists, or ASHAs, outside of a health center in Jhansi District, Uttar Pradesh, India. Photo courtesy of Reema Sharma. Reema looks on as one of the ASHAs shows her how mSakhi works on her simple mobile phone. mSakhi is helping these frontline health workers better communicate health information to pregnant women and new mothers. Photo courtesy of Reema Sharma. Reema with a group of ASHAs after they insist on a group photo. Photo courtesy of Reema Sharma.